Let's work together to uplift Puna, Hawai‘i Island, and its people. 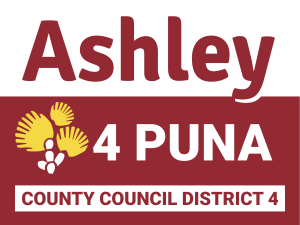 Ashley will revitalize Puna with vision and vitality. Our community is growing. The district needs effective leadership focused on getting Puna its fair share of resources, services, and attention. Our campaign seeks to build the collective WE. Government policies should work FOR the people, and be crafted in partnership with business, nonprofits, and community. The safety and wellbeing of our community is paramount. Along with more police officers for the district, we need programs in place that combat drugs and deter crime. As a first time candidate, I'm honored to have the endorsement of SHOPO – State of Hawai‘i Organization of Police Officers. Improving public transportation is key to connecting more people to services and opportunities. We need more buses, expanded service as well as park-and-ride lots throughout the district. We need an app to track our Hele-On buses and to partner up for seamless service, from one's doorstep to final destination. We need creative solutions to address and fund the infrastructure needs of the district. The longer we wait the more expensive it will be to fix. Having critical supporting infrastructure means we can reshape the development of our district into village and town centers to provide residents with programs, services, and opportunities. We can finance these investments responsibly by taking advantage of USDA Rural Development Loans and creating Improvement Districts. We all want to spend more time with our loved ones, pursuing our passions and enjoying this beautiful place we call home. We need more jobs, support services and recreation spaces close to home. We must protect our workers and working families, which is why I am proud have the endorsement of ILWU, UPW Hawai‘i, Operating Engineers, Hawai‘i Firefighters Association, SHOPO, and HLTA. Education is a great equalizer. Let's work with UH Hilo and Hawai‘i Community College to increase their presence in the district. We need to remove barriers and make it easier for folks to access the knowledge and skills they need to take their lives to the next level. More than one in four Big Islanders is 60 or older. While my mom and stepdad are still working, they like so many other kupuna need programs and services close to home so they can continue to live independently. Let's be real: lots of folks who live in Puna commute to the west side or Hilo town for work (I'm one of them). As a rapidly growing district, our roadways are becoming even more congested. DOT's contraflow test on Highway 130 was successful and can help alleviate congestion immediately. We need thoughtful, creative solutions to address traffic in the long-term. Drugs like crystal meth (ice) are a huge problem on Hawai‘i Island and often at the core of other crimes such as domestic violence, theft, and assault. It's impossible to arrest our way out of this problem. We need to ramp up our multi-pronged approach of education, treatment and prevention. We also need to support efforts to get ahead of the curve on opioid abuse in the islands. Hawai‘i Island has enough land to grow food to sustain our population. However, we need critical infrastructure and to merge agriculture with renewable energy and technology to make growing our own food cost effective and efficient. Puna needs an agricultural hub to process ingredients, manufacture fertilizer and to create value added products. Puerto Rico could be us. Hawai‘i Island is especially vulnerable to hurricanes because of its location. What recent lava events have shown us is that we must rely on ourselves. Preparedness must be part of our lifestyle. Government needs to empower community with timely, appropriate information, and partner with business and nonprofits to increase individual/family readiness. Hilo landfill is nearing closure. I am an advocate for incorporating the 3 R's – reduce, reuse, recycle – into our lifestyle and these actions being a catalyst for green jobs. We've been sitting on a Zero Waste Implementation Plan for nearly a decade. The current County Council Environment Committee Chair (my opponent) has done nothing to advance this plan. We need to move on this asap, but also consider ways to leverage our trash liability and turn it into an asset. We cannot kick the trash can further down the road. We owe it to future generations to consider all possibilities. This is an intriguing idea especially for those who can't handle the vertigo of being in the air or have their sea legs. People want to see the lava. They used to be able to walk right up to it, but now they're trespassing to see it because access is restricted. We need to leverage this natural phenomenon to stimulate our local economy. A platform must be done the right way, with safety, culture, environment and community in mind. Rebuilding and relocation should start where a foundation exists. We need to house people where infrastructure is, near schools and services. Let's take stock of existing assets such as foreclosed homes. There are numerous vacant lots in existing subdivisions. We also need to revise County Code to allow and support Accessory Dwelling Units (ADUs). Albizia is a death sentence to our native trees. We saw the devastation albizia caused to Puna and Ka‘ū during Tropical Storm Iselle. Former Council Member Zendo Kern introduced a bill on accountability, to compel property owners to take action. Ideally, we need to deal with albizia with a machete before it grows larger and we need to handle it with a D9. While we work to eradicate albizia, we can turn this liability into an asset and use it to build homes, create surfboards and as bioenergy feedstock for the near term.